With the increasingly popularity of software as a service (SaaS), enterprise software vendors today cannot afford to be without a cloud strategy. As a result, traditional vendors have introduced various forms of hosted, hybrid, and SaaS deployment options. These co-exist alongside the vendor’s traditional on-premises license model, as shown in Figure 1. But software as a service is more than just another deployment option, another way to consume software. SaaS is a business model. SaaS not only affects the product: it should drive the nature of how the provider does business, from how the product is developed and maintained to how it is sold, implemented, and supported. It should permeate the very culture of the provider’s organization. For the moment, ignore the various definitions of “true SaaS.” Let’s assume a traditional vendor can deploy its system in a way that meets the various criteria of SaaS. 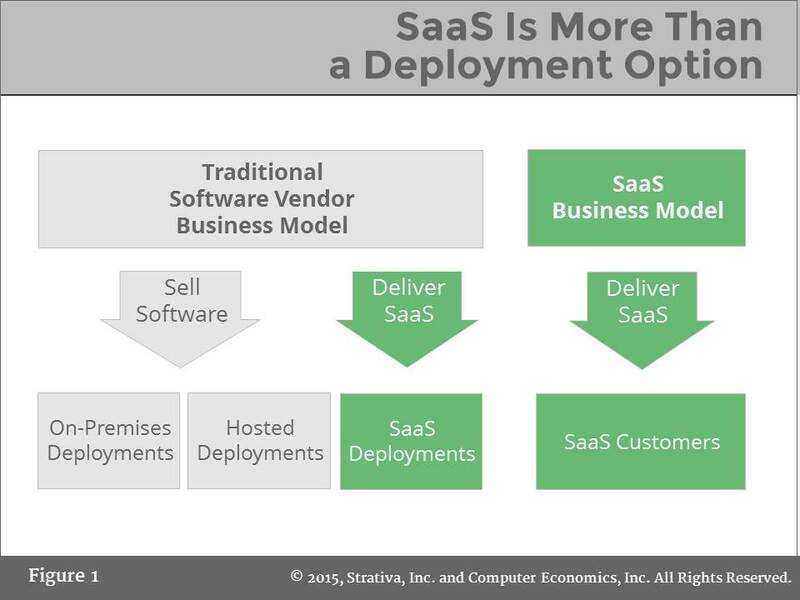 Even so, if SaaS is just another deployment option, the vendor will not have a SaaS business model and customers will not receive the full benefits of SaaS. Service mindset. A true SaaS provider is not a software vendor. The term “vendor” implies sales of a product. You pay money to a software vendor to get software products delivered, just as you put money into a “vending” machine and take candy bars out. But with SaaS, no products are sold. Rather, a service is delivered. It is an entirely different mindset. Alignment of interests. Traditional vendors talk about “shipping software,” as if software were like automobiles shipping from an assembly plant. The software license sale is a major milestone. For most vendors, the implementation is another important milestone. But what happens after the sale and implementation is largely the customer’s responsibility. If the customer buys $100,000 of software but only uses $10,000 of it, the vendor feels little pain. A SaaS provider is entirely different. The initial subscription and implementation is just the beginning. The initial subscription period often just covers the cost of sales. SaaS providers only make real money when that customer fully uses the service and renews for future years. If the implementation is a failure, the SaaS provider loses. Therefore, the provider’s interest and the customer’s interest in success are much better aligned under the SaaS model. A renewal business. Traditional vendors may argue that maintenance fees are just as important to them as subscription fees are to a SaaS vendor. In a fundamental sense, this is not true. A traditional vendor does not suffer if a customer does not take advantage of upgrades under maintenance. Traditional vendors are quite willing collect maintenance fees on shelfware. In fact, such customers are the most profitable, as they never call the help desk for shelfware. SaaS customers, on the other hand, rarely renew subscriptions for SaaS shelfware. As soon as the initial subscription period expires, they cancel. Continuous innovation. Because version upgrades require significant effort by customers, traditional software vendors typically release new versions on a bi-annual basis, at best. Even this pace of change can be too frequent for customers maintaining their own on-premises systems. As a result, customers are often several years behind the current version. The best SaaS providers, on the other hand, introduce new capabilities on a continuous basis, allowing customers to “opt-in” to those features where they see benefits. They do not need to wait for the next release, which could be years away. At a more tactical level, SaaS providers do not “ship” bug fixes or patches for customers to apply: they patch their systems immediately for all customers. Customer intimacy. SaaS providers operate systems on behalf of customers. If a customer is not using the software, or has a significant percentage of inactive users, the SaaS provider knows it. The provider sees it in its system logs. The best SaaS providers use this information to proactively reach out to customers to determine the impediments to system usage. Traditional vendors have no clue about how their customers are using their systems. In some cases, they do periodic audits—not to help customers make better use of the software but mostly to determine if customers are out of compliance and can be subject to additional license fees. Customer community. With traditional software, customers are on different versions of the software, sometimes years apart from one another. Although they have user groups, these are not as powerful as communities of SaaS customers where everyone is on the same version. Customers can immediately take advantage of new features as they are released into the production service and can collaborate with one another about how to make best use of them. Taken further, SaaS providers are in a position to aggregate anonymized customer data to develop benchmarks and best practices. Traditional vendors are in a difficult position, unless they are willing to abandon their on-premises customers or spin off their cloud development programs as a separate business. Very few do so. Most choose to add SaaS or hosted deployment options alongside their on-premises option. This is a marketing message, not a strategy. Traditional vendors that merely add SaaS as a deployment option face a number of strategic challenges. The most obvious—but most easily fixed—is in sales compensation. Software sales people are accustomed to big paydays when they sell initial licenses. Sales people therefore, can be demotivated in selling the SaaS deployment option, which does not have big upfront fees. Vendors have various ways to fix this problem, usually by paying equivalent incentives up front and assuming the risk of customers not renewing beyond the initial subscription period. In some cases, vendors desperate to establish their cloud credibility even over-compensate salespeople for selling cloud services. But even if the sales compensation problem is overcome, it is hard for traditional vendors to transition fully to a SaaS business model. Because so much of their business remains with on-premises customers, they do not develop a services mindset, and their interests are not fully aligned. Because they have to continue support for on-premises customers, they cannot release new features continuously to their SaaS deployment versions. If they do they will break their promise that customers can easily switch back and forth between on-premises and cloud deployment. They do not develop customer intimacy nor foster customer communities to the same extent that the SaaS-only providers can. Should Buyers Exclude Traditional Vendors? Does this mean that organizations looking for cloud systems should limit their choices to SaaS-only providers? Certainly not. In our ERP software selection consulting, we do not limit our short listing to SaaS-only providers. There are a number of reasons that an organization might want to consider the SaaS deployment options of traditional vendors. In some categories of enterprise software, and in some sectors, the functional fit of the traditional vendors exceeds that of the SaaS-only providers. This gap will not persist forever. But for now, in some industries, the best solutions are still with the traditional vendors in terms of functionality. For now, the hosted or SaaS deployment options of these vendors are often good enough to win the deal over SaaS-only providers. Geographic location is another strong consideration. As newer providers, some of the SaaS-only providers do not cover all geographies worldwide. A traditional provider’s hosted or cloud deployment option may be a better fit for those regions. As with functional fit, however, this gap will not continue forever. Finally, an organization that has made significant investment with a traditional vendor may not want to make a total changeover to a SaaS-only provider. In such cases, migrating to the cloud or hosted deployment option of the incumbent vendor may be a legitimate compromise that delivers some of the benefits of SaaS without a disruptive switch to a completely new provider. Despite these practical considerations, business leaders are beginning to understand the benefits of dealing with a provider that has SaaS as a business model, not just as a deployment option. In our work with customers and at user conferences, we see many organizations that have made the switch to cloud-only providers. We rarely, if ever, see customers making the switch back from SaaS to on-premises systems. Vendors may push “customer choice” as a marketing message, but we see few customers choosing to switch back to on-premises systems. One final thought: not all SaaS-only providers fully deliver on the SaaS business model. The product may be “true SaaS,” but it does not guarantee that the provider will nurture a customer service mindset, develop customer intimacy, or foster community. In fact, some SaaS-only providers need improvement in these areas. For organizations looking for new systems, it pays to check references, even with pure SaaS providers. The software industry is changing. Just as packaged software vendors won out over custom-written applications in the 1980s, so also SaaS is now winning against that traditional software vendor model. The rapid growth of the cloud-only providers over traditional vendors is evidence of this shift. This entry was posted in Business Strategy, CRM Selection, ERP Selection, HCM Software Selection and tagged Cloud, SaaS. Bookmark the permalink.